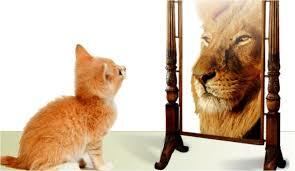 Did you know that Yahweh’s (I AM the covenant keeping God of your present) view of you, often differs from your own? Gideon (one who permanently cuts down the enemy) had the angel of Yahweh appear and talk with him. Gideon was hiding, in the winepress, threshing wheat, due to fear of the enemy, who had oppressed the Israelites for seven years. The angel said, “Yahweh is with you, mighty warrior.” (Judges 6:12) Even though Gideon was fearful, weak and felt he was a nobody, Yahweh knew his true character. He was a mighty warrior, who would obey Yahweh and see his country delivered. Israel suffered devastation, by their enemies destroying their crops, houses and land. They were hiding in caves when they then cried to Yahweh to save them. Gideon was the mighty warrior, who fully depended on Yahweh. Today, Yahweh is speaking to the weak and calling them strong, the fearful he calls mighty warriors, the people-pleasers he challenges to live as God-pleasers, the mild become roaring lions, the helpless become empowered through God’s transformation of them. His Holy Spirit lives, inside of believers, and they see the truth, about themselves. With Yahweh leading and guiding you, your reliance is no longer on what you can see, in the natural world or your circumstances. He fights your battles and lets you help him! Thank you for sounding the trumpet! Timely word received with joy. May we communally pray to lift one another up in prayer to be strong and courageous in our faith. For the weak to feel the power of God’s Holy Spirit! When I was writing my book, I should have included Gideons story! Thank you for the reminder. Mighty warrior–yes! Yes, Gideon is one of my favorite s. Fearful and doubting to a mighty warrior who rises up to take his place as a deliverer! We all need to rise up as a mighty warrior! Praise God for making you a mighty warrior! I have AWAKEN!! I have been dealing with a house cat/lioness metaphor for some time now. I am often reminded that I am a lioness and told to carry no fear in the presence of the enemy. My life has really changed over the last several years. I am being groomed and prepared for the final conflicting​ trek. God bless you! Praise God that you are awakened! God is speaking to many that they are a lioness! Change is good! So glad you enjoyed it. Blessings! Praise God who sees the true character of those who hide in the shadows and calls them mighty warrior! You are welcome!